This is one of the most beautiful movie posters I’ve ever seen. No lie. Amber’s ideal life is shattered when she loses her husband to the war in Afghanistan. Two years later, she finds herself in a struggle to save her home while providing for her 9-year-old daughter, Bree. When up-and-coming race car driver Cody Jackson rolls into town, Amber and Bree become wrapped up in his pedal to the metal way of life. With her faith hanging in the balance, Amber is forced to decide between the broken road she knows so well or trusting in a new path that God has provided. There seems to be a trend lately among Christian film: take a famous Christian song and make a movie based on that song (however tentatively). 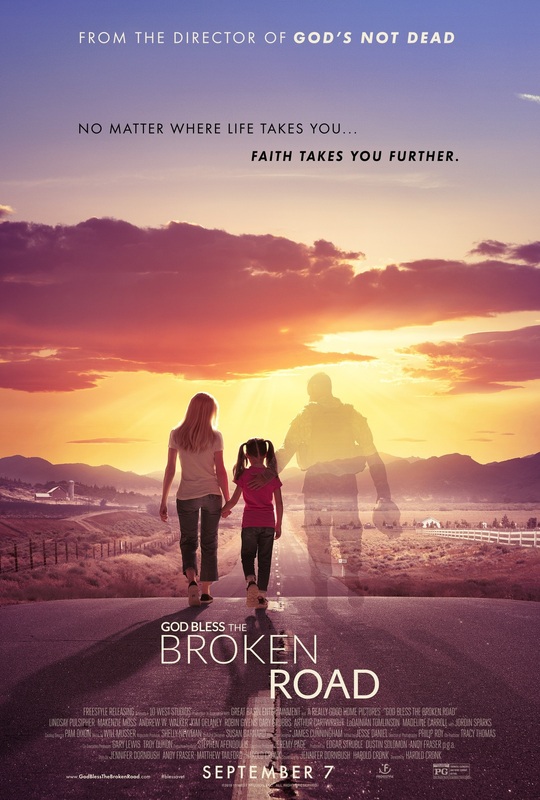 The God’s Not Dead franchise, ‘I Can Only Imagine’ (2018), and now ‘God Bless The Broken Road’ (2018). -The director, Harold Cronk, knows how to make a quality film in terms of camera work and lighting. I dug the vintage aesthetic of this film. -On a whole, the characters were pretty likable. Amber was a sympathetic protagonist. Her daughter, her friends from church, and Cody were all sweet. My favorite character was probably Amber’s mother-in-law, though. She could be controlling and manipulative, but in the end all she wanted to do was keep her family close. -I felt that Amber’s struggles to provide for herself and her daughter were accurately – and heartbreakingly – portrayed. Those scenes were some of the best in the film. -It was just kinda…bland? A little boring, too. I found my interest straying through many of the scenes, which was disappointing. But that’s basically my only complaint. And for those who aren’t as nitpicky as I am, I think you could find ‘God Bless The Broken Road’ to be a hidden gem. Have you seen this film? What’s your favorite faith-based movie? Film has been provided courtesy of Pacific Northwest Pictures and Graf-Martin Communications, Inc.
I’m kind of curious about the race car driver thing . . .
Yeah, I’m thinking you might enjoy the film more than I did because of that aspect of it. Looks interesting enough to try it! I haven’t really heard much about this film yet.